Almost 30 years before the original Oculus Rift DK1 hit Kickstarter, View-Master was already dabbling in virtual reality—albeit a tamer version—with an electronic viewer that mixed 3D images and audio into what was probably a revolutionary experience back then. 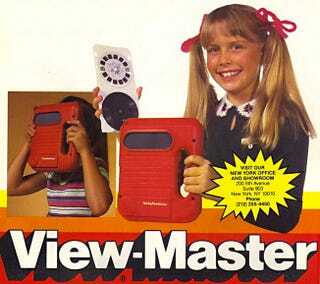 Seen here in an ad dating back to February of 1983, the Electronic Talking View-Master used the same slideshow discs as previous versions of the toy. But they were embedded in a special cartridge alongside a tiny vinyl record that would be played at the same time.